Am I Allergic To Cats? Dogs? Take our quiz and learn about indicators! Home / Uncategorized / Am I Allergic To Cats? Dogs? Take our quiz and learn about indicators! Sometimes it’s hard to tell whether or not you’re allergic to pets. People can have allergic reactions to all sorts of things, so establishing a link between your symptoms and your animals is a tricky business! We’ve created this little quiz to help you explore the matter. It’s split into two parts. The first is an assortment of general knowledge questions to see how much you know about pet allergies. The second is a bunch of indicator questions, designed to help you establish whether or not your allergic reactions are being triggered by pets or something else. Which of these breeds is considered hypoallergenic (i.e. easier for allergic folks to tolerate)? Answer: none of the above. There’s no such thing as a hypoallergenic breed. However, some kinds of dogs and cats produce less of the proteins that cause allergic reactions. Also, some breeds have coats which minimize the spread of allergens. Answer: no. Pet allergies are triggered by proteins that are released in pet sweat, saliva, and dead skin flakes (dander), as well as urine. Answer: yes. Sneezes, sniffles, coughs, sore throats, itchy eyes, and congestion are all common signs of a pet allergy. 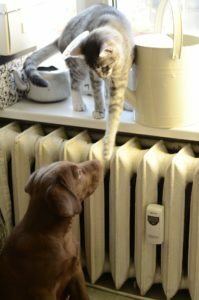 What pets are least triggering to people with allergens? Answer: reptiles are the closest thing to hypoallergenic that exists! All furry mammals tend to be triggering to some extent. Can you have an allergic reaction if you’re not in the same room as an animal? Answer: yes. Absolutely! Pet allergens collect practically everywhere, especially on clothing and soft furnishings. That’s why it’s important to keep your animals out of your bedroom if you suffer from allergies. Are pet allergies the same thing as allergic rhinitis? Answer: yes. Allergic rhinitis can either be seasonal (like hayfever) or chronic/persistent, which is what you’d see around animals. Both versions have similar symptoms, primarily in the nose, throat, eyes, skin, and mouth. One way to tell the difference between seasonal and pet allergies is to observe your symptoms when the seasons change. 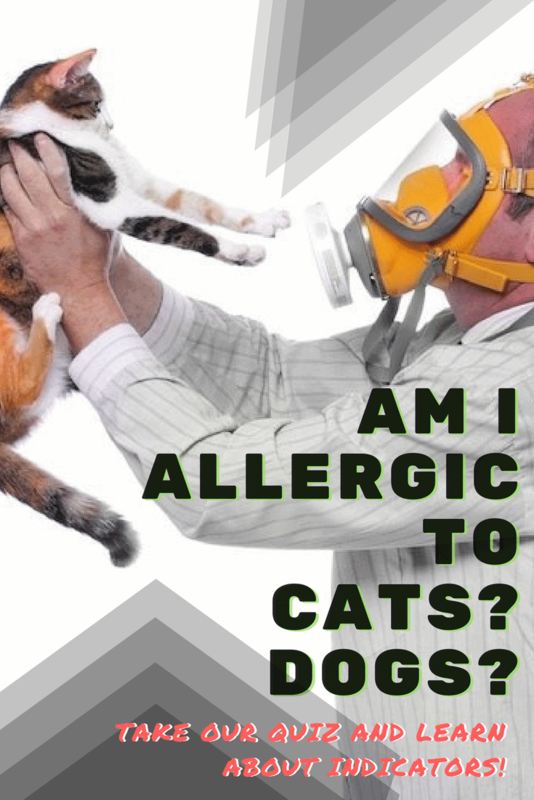 If they’re the same, you probably have either a dust mite or pet allergy rather than a seasonal problem. Which of these things won’t help you address pet allergies? Answer: keeping pets outdoors. You’ll still be tracking plenty of allergens inside on your shoes and clothing. Make sure you can clean them up thoroughly with a HEPA-grade vacuum! Find recommendations for the best pet allergy vacuums on our homepage. Answer: no, not necessarily. Immunotherapy has been shown to be effective as a long-term treatment option. You can ask your doctor and/or allergist if you’re interested in pursuing immunotherapy. How long does it take for pet allergens to leave an environment? Answer: 6 months. So, moving into an apartment or house where previous owners have had pets can be very aggravating, even when the animals have left the premises. Part 2: Do you have allergies? Do you have allergic reactions year-round instead of seasonally? Do you sneeze frequently around pets? Do you notice skin irritation after petting animals? Do you find your nose running when you’re visiting homes with lots of pets? Do you get a scratchy throat when there aren’t any relevant seasonal pollen issues at hand? Do you find that your symptoms are worse indoors than outdoors? If you answered yes to more than one of those questions, it’s time to see your doctor or consult an allergist! You might have pet allergies.